Fiber cement siding is one of the lowest maintenance siding options on the market, and at Lakeside Exteriors, we pride ourselves on our unmatched installation of James Hardie® fiber cement siding products. However, no matter the installation process, any home’s exterior experiences the outside elements and needs to be clean and maintained. How to Clean Your Siding? Cleaning your fiber cement siding is important for its durability and lifespan. The finish on the product gives your siding its protection and resilience. Therefore, ensure you are using the proper materials and methods when cleaning your home’s exterior. Abrasive brushes or cloths and harmful chemicals can damage siding and should be avoided. It is also important to ensure you are wearing proper protective equipment. Wearing glasses and gloves will help protect you as you clean, and covering any surrounding landscaping will help protect your yard throughout the cleaning process. Simply dampen your cloth and wipe over the siding, rinsing the cloth frequently to prevent any dirt particles from scratching the finish. Be sure to rinse the cleaned area after wiping. If you prefer to use a paint brush, simply brush off the dirt or dust particles and then rinse the siding. Dampen your cloth, adding the mild soap. Wipe the exterior surface of your home, making sure to rinse the siding properly, not letting the soap dry on the exterior. Again, be sure to frequently cleanse the soft cloth during the process to avoid debris scratching the exterior finish. After selecting your cleanser, follow the instructions on the package. Wash the moldy area, and then rinse the area thoroughly, ensuring you have removed all cleaning product. How to Maintain Your Siding? Low maintenance in no way means no maintenance. 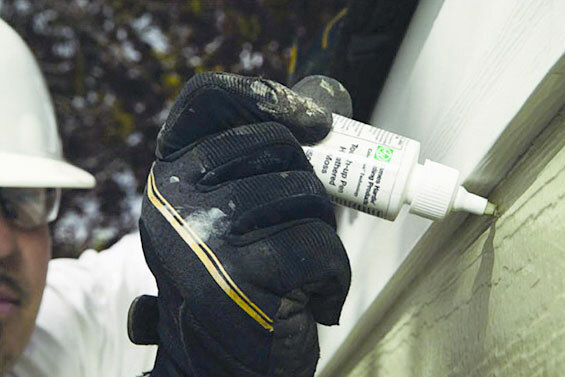 While cleaning your siding is only one aspect of your fiber cement product’s maintenance, you should also pay attention to caulking and painting. While the fiber cement product is water resistant, installers are likely to use silicone caulk around adjoining portions of the home. Windows, door frames and other exterior edges are likely to have a layer of caulking. It is important to examine these areas frequently to ensure your siding is sealed tightly, preventing water from penetrating the exterior. Another important facet to evaluate is the status of your siding’s paint. While the paint on fiber cement siding can last up to 15 years, paint is an important factor for your home’s aesthetic and protection. Inspect your exterior paint regularly to ensure your siding lasts. If your paint looks worn down, it may be time for an update. With the proper cleaning and maintenance, your fiber-cement siding will last for many years to come.